← Caffeine Math: How much caffeine is in a tea blend? Back in November, I wrote about #TeaAcrossAmerica, a program that’s putting tea bushes in all fifty states plus the District of Columbia. By joining the program, I agreed to host Montana’s tea plant, which arrived at my tea shop yesterday. The plant, which we named “Tea H. White,” is a China bush (Camellia sinensis var. sinensis), which is tolerant of cold, but not nearly tolerant enough to spend a Montana winter outdoors. The plant can take an occasional light frost, but not temperatures like the -27(F) we had for a couple of days early last month. This means that Tea H. White will be living indoors. Tea H. White comes out of his shipping container and gets introduced to his new Montana home. My tea bar has east-facing bay windows that should be a great place to keep the plant, with full morning sun and afternoon shade. We’ll have to work on the humidity, since it’s pretty dry out here, but we can do that. In the picture above, you can see that our cutting came out of the shipping box a wee bit dehydrated, which is to be expected after a few days in USPS trucks and planes. The first thing I did — after dragging him around the store and showing him to everybody — was get him into the sink, where he soaked up a lot of water and started perking back up. A very thirsty little tea bush gets a big drink. Why the name? Well, our shop is a bookstore, which is why we’ve gone with literary names for some of our tea blends (e.g., Lady Greystoke and Fifty Shades of Earl Grey). In looking for the author-related puns, Tea S. Eliot was the first to pop to mind, but Shannon Brewer Land already used that name for the Alaskan Tea Across America plant — although she later changed it to Captain James Tea Kirk. 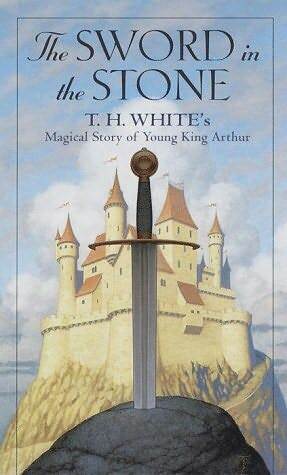 The Sword in the Stone, the first book of T. H. White’s series, The Once and Future King. As it turns out, Tea H. White is a better name for our plant anyway. T. H. White is the author of the groundbreaking The Once and Future King series, which tells the King Arthur legend starting with Arthur’s childhood. We are definitely lovers of fantasy novels and Arthurian stories, and as a children’s author myself, I really enjoy good young adult literature. As soon as little Tea H. White started perking up, our assistant manager, Doug, was ready to pluck a leaf and start drying it. After fighting him off with my trusty pu-erh knife Excaliber, we decided to let the plant turn into a bush before we start trying to drink it. I sympathize with Doug, though. Patience is not my strong suit either. I am curious. I’d like to know whether this is the first tea bush in Montana. Has anyone else tried this experiment? Is there a little tea garden growing in a greenhouse in Missoula? A tea bush in a shop in Helena? A cutting thriving in someone’s sun room in Bozeman? If any of my readers know about another Camellia sinensis bush in Montana, let me know. I’d love to compare notes with someone else who’s done this! Posted on 19 January 2014, in Tea Thoughts and tagged #TeaAcrossAmerica, Alaska, Camellia sinensis, James Tea Kirk, King Arthur, Montana, Shannon Brewer Land, T. H. White, Tea Across America, Tea H. White, Tea S. Eliot, The Once and Future King, The Sword in the Stone. Bookmark the permalink. 3 Comments. I have a Sochi varietal C. Sinensis sinensis in Bozeman! It didn’t like spending the cold winter on the porch though, and will take some time & effort to revive. Good to know my tea plant has a cousin here in Montana!